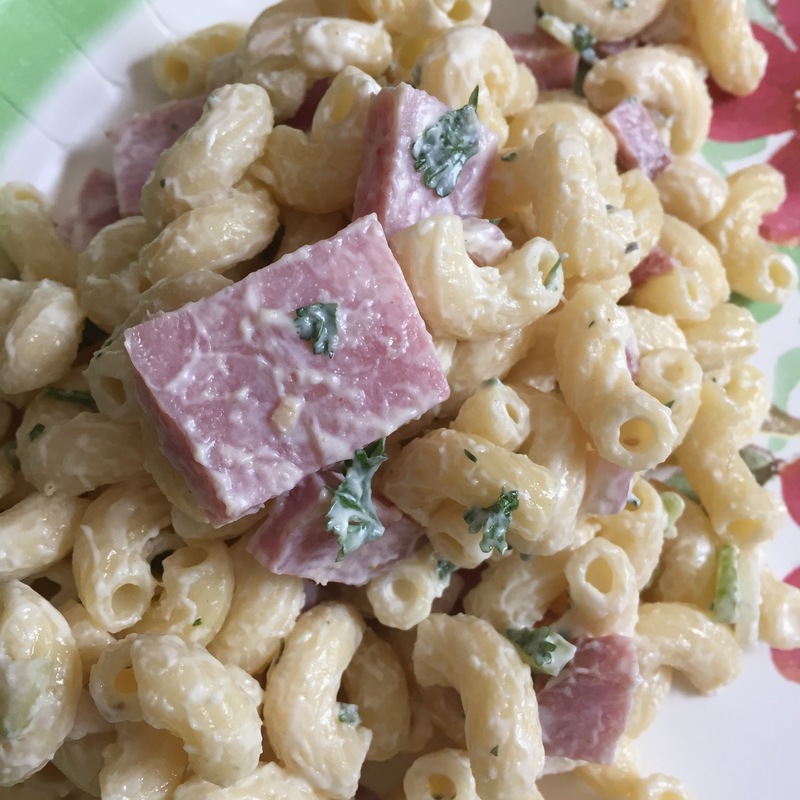 This is my second recipe for Hawaiian Potato Macaroni Salad that I have made to replicate the salad I had at a Luau in Maui last year. My husband and I both agree that this is the better recipe of the two Potato Mac Salads. I received this recipe from an acquaintance on a food forum, who lives in Hawaii. It is a winner! I think the key ingredient that makes this recipe great is the Spike Seasoning. You should be able to find it at your grocery store. There was also 1 teaspoon salt added to this recipe, but I think I would omit it next time it makes it very salty. If you feel it needs more salt though by all means add it. Cover the potato cubes with cold salted water and bring to a boil. Reduce the heat to low and cover, continuing to cook the potatoes for 12 to 15 minutes. Drain immediately and set aside to cool completely. Cover the eggs with cold water, bring to a boil. Turn heat off, cover and allow the eggs to cook in the hot water for 10 minutes. When the 10 minutes are up immediately shock the eggs in water with ice cubes added to them. This prevents the eggs from developing a green ring around the yolk. Peel and chop the eggs once cooled. Cook the elbow macaroni according to package directions. Drain and rinse with cold water to cool them off and stop the cooking. Grate the sweet onion and carrot with a grater and place the grated vegetables in a large salad bowl. Add the frozen peas (don’t worry they thaw quickly – just make sure they are not super icy or you will add water to your salad too.. if it is frosty you can rinse them in warm water first). Add the potato, elbow macaroni, boiled chopped egg to the vegetables. Then add the sweet pickle relish, spike seasoning, enough mayo to make it creamy (to taste) and mustard. Stir gently with a spatula to fold the salad together and not break the potatoes up too much. Chill or serve immediately. If you do chill it you may need to add more mayonnaise just before serving. Categories: Side Dish - Pasta, Side Dish - Potatoes, Side Dish - Salad, Side Dishes | Tags: Hawaiian Potato Mac, Hawaiian Potato Macaroni Salad, Macaroni Salad | Permalink. On our recent trip to Maui, we were fortunate enough to go to a Luau at the Grand Wailea Resort in Wailea. Their luau was the best we have ever attended and the food was very good. One offering on their buffet that I was skeptical about was their potato macaroni salad (Potato Mac for short). How can you combine macaroni salad and potato salad and get away with that!? Isn’t that a crime? Well, as it turns out, it is NOT a crime. It was one of the items I most enjoyed. I skipped the poi this time, I ate it last time and was unimpressed! 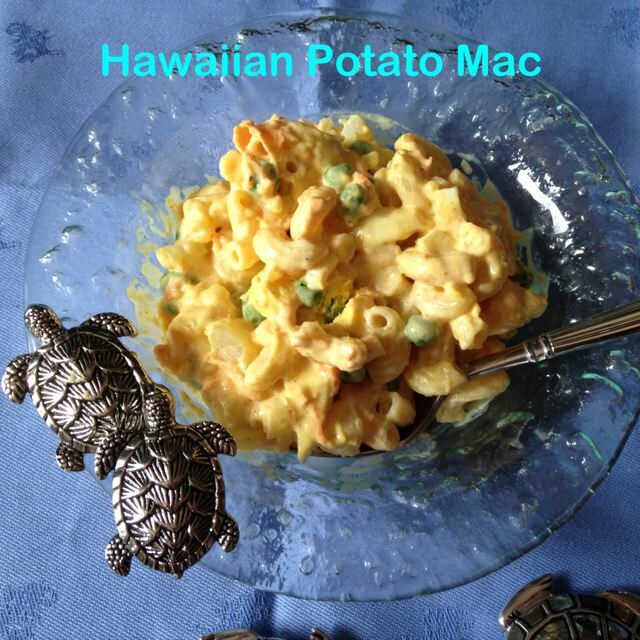 Anyway… on to the good stuff: Hawaiian Potato Mac! I immediately went online to find a reliable recipe. I think I found one on allrecipes. I did not have celery seed, so I omitted it. Also I did not need 20 servings so I cut the recipe in half, increasing the eggs to 3 and kept the macaroni at 1 cup because in the original recipe there were more potatoes than macaroni, and at the luau it was mostly macaroni.. so here is my rendition of Hawaiian Potato Mac. Place the eggs in a saucepan and cover with cold water. Bring them to a boil, turn off the heat, cover with a lid and allow to sit for 10-12 minutes. Immediately after that place the eggs in ice water. This will prevent the eggs from having a green ring around the yolk. Chop the eggs into small dice. Cover the potatoes with cold salted water and bring to a boil. Cover, reduce the heat to medium low to maintain a boil and cook them for about 15 minutes or until they are fork tender. Drain them immediately and run cold water over them. Chop the potatoes into small pieces once they are cooled. Cook the elbow macaroni according to package directions and drain them immediately also running cold water over them to stop the cooking process. In a medium bowl, combine the mayonnaise, red wine vinegar, curry powder, celery seed, salt, and pepper and stir to combine. Add the finely grated carrot, cooked peas and finely minced onion to the dressing. Gently fold the mayonnaise dressing with the chopped eggs, cooled macaroni, and cooled potatoes. Cover and refrigerate for at least 3 hours. Categories: Ethnic, Ethnic - American, Side Dish - Pasta, Side Dish - Potatoes, Side Dishes | Tags: Hawaiian Potato Mac, Hawaiian Potato Macaroni Salad, Luau Food, Potato Mac | Permalink. I don’t know a bout you, but I love Panera! I love their sandwiches, soups, and sides. Their macaroni and cheese is quite outstanding and creamy. After ordering the side recently I went home wanting to find a copycat recipe for the dish.. but I didn’t have to… as it turns out, Panera is quite willing to share the recipe with everyone. I made it too – I did not have the exact cheeses – I used yellow American cheese instead of white American cheese, and it still turned out quite close to the one they sell. They use shells in the recipe, but you could use any pasta you like. The surprising ingredient in the Panera recipe is a dash of Frank’s Hot Sauce. It is very subtle though. 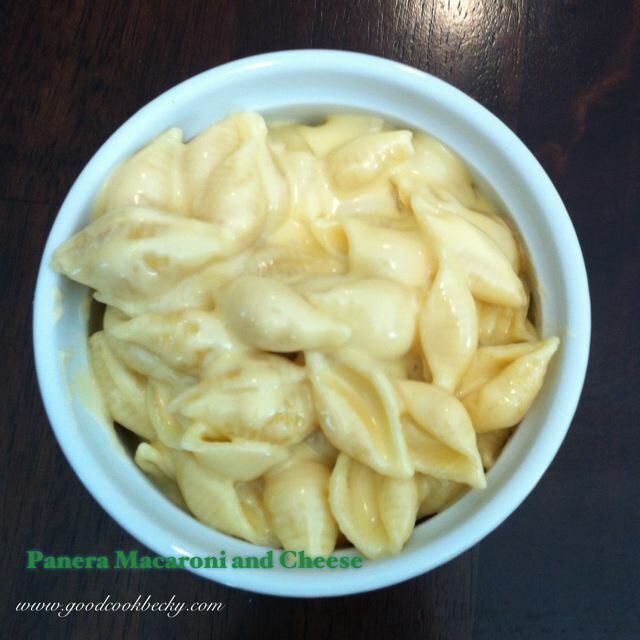 Here is a link to Panera’s Recipe. Categories: Eating Out, Ethnic - American, Main Dish, Main Dish - Pasta, Side Dish - Pasta, Side Dishes | Tags: Macaroni and Cheese, Panera, Panera Mac and Cheese, Panera Side | Permalink. I don’t think I have ever made a recipe by Ina Garten aka “Barefoot Contessa” that I have not liked! Here is another winner from her. Thank you Ina! I love the combination of sun-dried tomatoes with the cheese and Kalamata olives. It is certainly a grown up taste. My kids are not fans of olives that come in cans and in vinegar – so this salad is more for me and my hubby. I used tri color spiral pasta instead of white ones – I think it looked prettier. I will be adding this salad to a semi regular rotation though. Cook the spiral pasta in boiling salted water and a splash of olive oil according to package directions. Drain well and allow to cool. In a large bowl, place the pasta, chopped tomatoes, chopped olives, diced mozzarella, and sun-dried tomato pieces. Toss to combine the ingredients. Process the ingredients listed for the dressing in a small food processor. Pour the ingredients over the pasta salad and toss to coat the salad with the dressing. Sprinkle the salad with the grated Parmesan cheese and basil. Chill and serve. Warning: this salad is highly addictive! If you are like me, you will not be able to stop eating it until it is gone, and then you will make some more the next day! Categories: Ethnic - Italian, Ina Garten, Side Dish - Pasta, Side Dish - Salad | Tags: Ina Garten Pasta Salad, Pasta Salad with Sun-dried Tomatoes | Permalink. 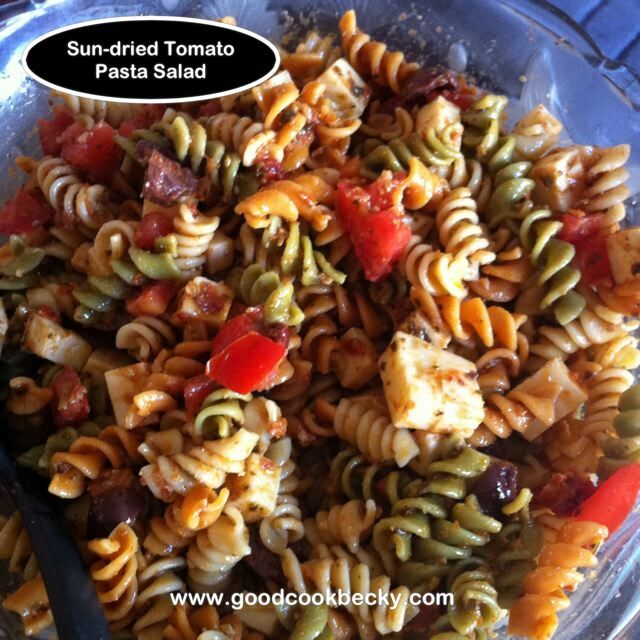 Here is another lovely Pasta Salad that I like to serve with BBQ foods. 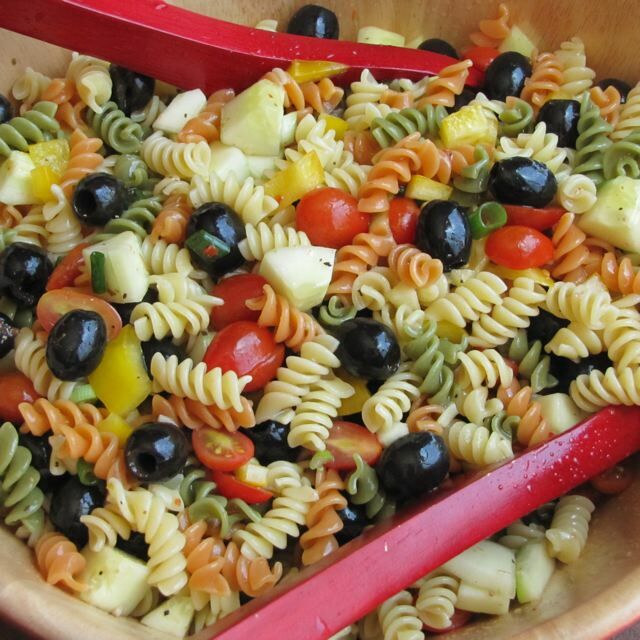 It is a variation on the Veggie salad, but with tri-color rotini pasta. Cook the pasta according to package directions. Drain and shock with cold water to bring the temperature down. Combine the pasta, veggies and the dressing. Toss. Chill and serve. Categories: Side - Vegetable, Side Dish - Pasta, Side Dishes | Tags: Pasta Salad | Permalink. I’ve said I was a fan of allrecipes.com before and I will say it again. 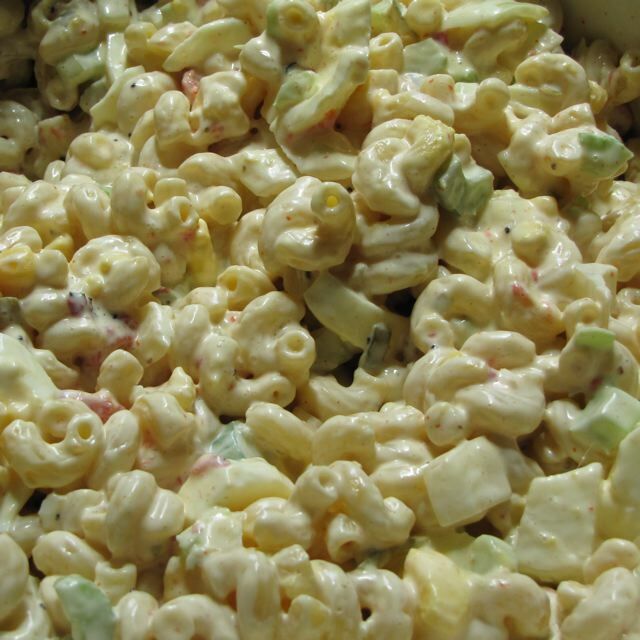 I made this macaroni salad because I had little else in the fridge to eat for lunch, so I made this recipe. I made a few changes to the original (the original recipe called for 3/4 cups of sugar! – that sounds way too sweet to me for the amount of salad; I also reduced the amount of celery and changed the onion to 1/4 cup sweet onion- like Walla Walla, Maui or Vidalia). Never the less, after tweaking the recipe it is quite yummy! I love Macaroni Salads that have eggs in them and this is one. Next time I will add some chopped fresh dill or parsley to brighten it up a little. Bring a pot of lightly salted water to a boil. Add Macraroni and cook according to package directions. Drain, rinse, and cool completely. In a large bowl combine the remaining ingredients and stir them together. Pour the dressing mix over the cooled macaroni and stir to combine. Cover with plastic wrap and cool at least 1 hour. Enjoy. 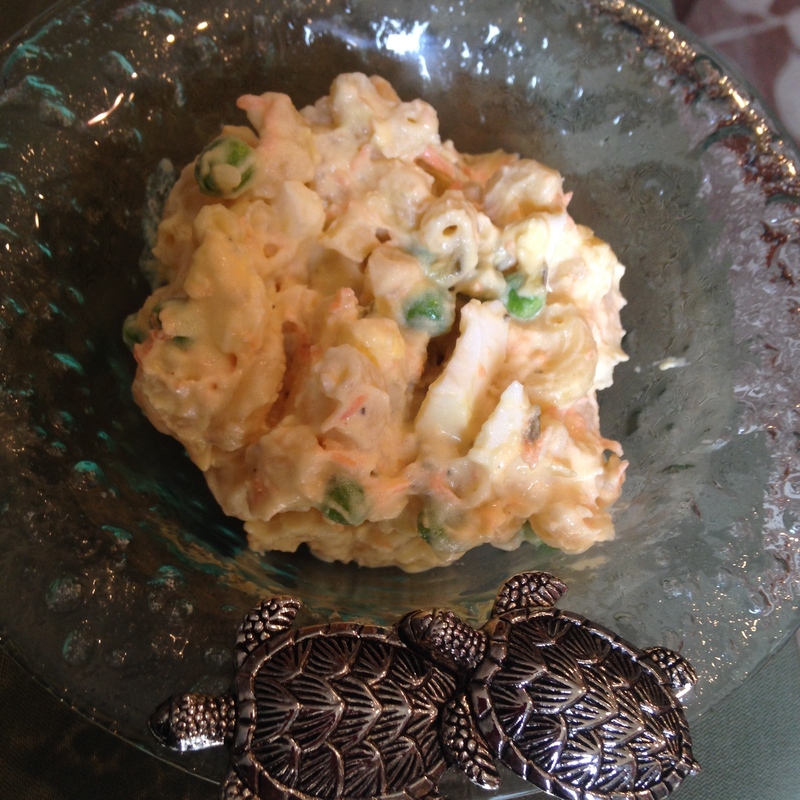 Categories: Ethnic - American, Side Dish - Pasta | Tags: Amish Macaroni Salad, Macaroni Salad | Permalink.